Mary has been involved in search and rescue since 2002. She is currently serving as the Scout Coordinator and is responsible for assisting both new and current members on their scout skills. She has earned a SARTech II from the National Association of Search and Rescue. She has additional training in scent theory, CPR, first aid and K9 first aid. Mary is a civil engineer and also holds a structural collapse specialist certification as well as NIMS certification through FEMA. Mary's current K9 partner is Woof, a certified tracking/trailing dog. Woof is Mary's second K9 search partner. She is currently training her 3rd partner, Calvin, in trailing. 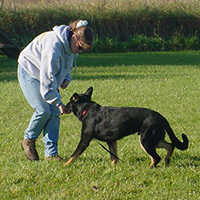 Woof is a German Shepherd who is certified through L.E.T.S. in trailing. He has been certified yearly since 2008. He has also been certified by NAPWDA (North American Police Work Dog Associations) in the past. He is also cross trained for recovery.